It will contribute €12 million of new equity to the Hamburg-based to complete the stake acquisition. UWL offers transport and engineering solutions, including transporting wind turbine components from manufacturing sites to pre-assembly ports. It currently provides vessels to other companies through a charter system, and plans to expand its fleet by building "up to four" new vessels at Jiangsu Zhenjiang Shipyard, north of Shanghai in China. The first two vessels have been ordered and are due to be delivered in 2020, UWL stated. The service provider also offers turnkey solutions including complete project management, design and procurement, lashing and securing concepts, and lifting appliances. "We are very pleased to team up with FOO and are looking forward to working together. Combining our strengths and our expertise within the offshore wind business, we already have identified a number of synergies," said UWL founder Lars Rolner. Norwegian company Fred Olsen Ocean owns vessels supplier Fred Olsen Windcarrier and mono-bucket specialists Universal Foundation. It also owns a majority stake in offshore wind installation and services firm Global Wind Service through Fred Olsen Windcarrier. 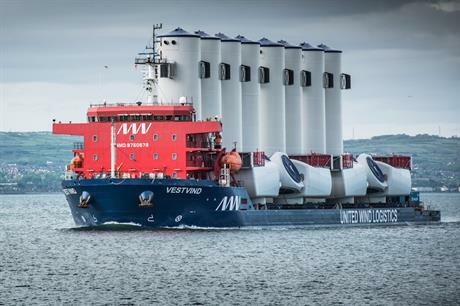 "The investment in UWL marks an expansion of FOO’s footprint within the offshore wind service industry and will further strengthen our presence in the logistics and installation value chain for offshore wind," said Fred Olsen Ocean CEO, Even Larsen.